Today would have started better if I had remembered that the clocks went back. 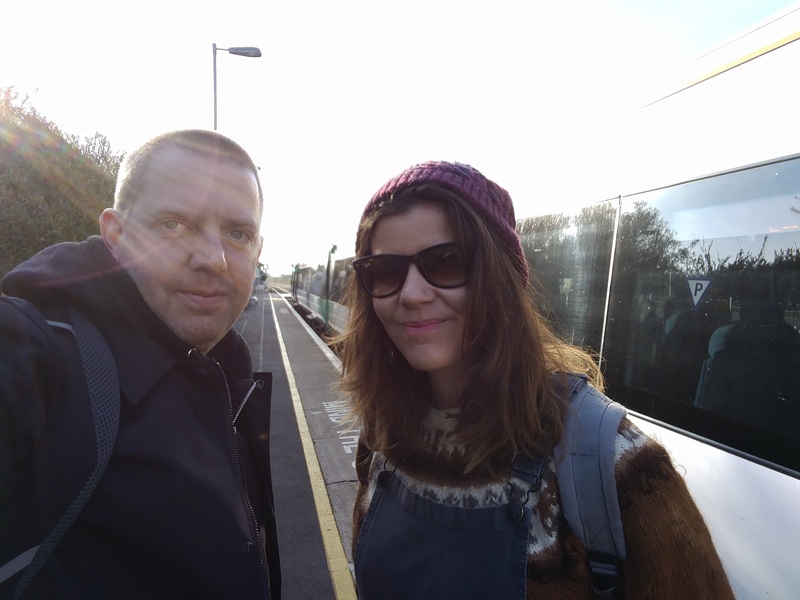 I just about made it to the station on time to meet Vicky Matthews for the train to Berwick. From there we walked along the A27, past the giraffes at Drusillas, and into the village of Wilmington. 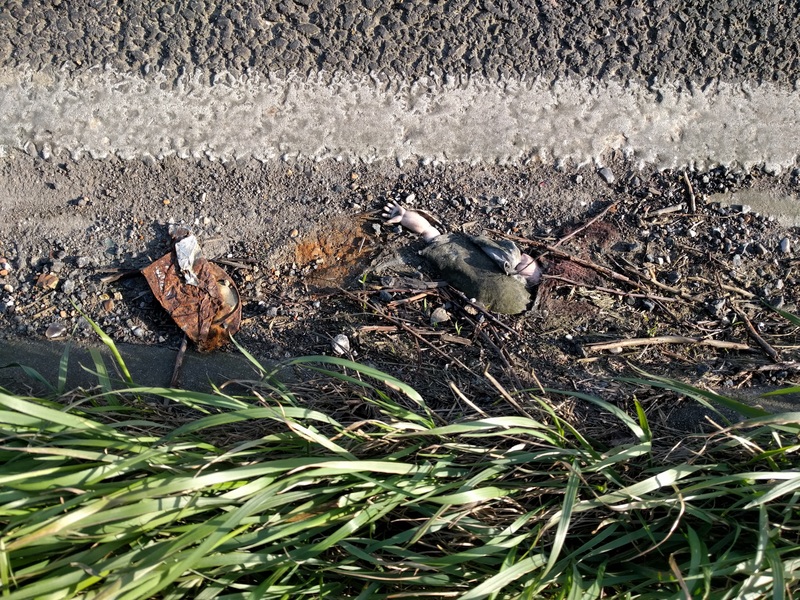 There’s some strange roadkill in this part of Sussex – what is that doll’s arm doing? We were out to explore the ley-line beginning in Wilmington. It’s described in a couple of Paul Devereux books, including the Ley Hunters Companion (written with Ian Thompson). 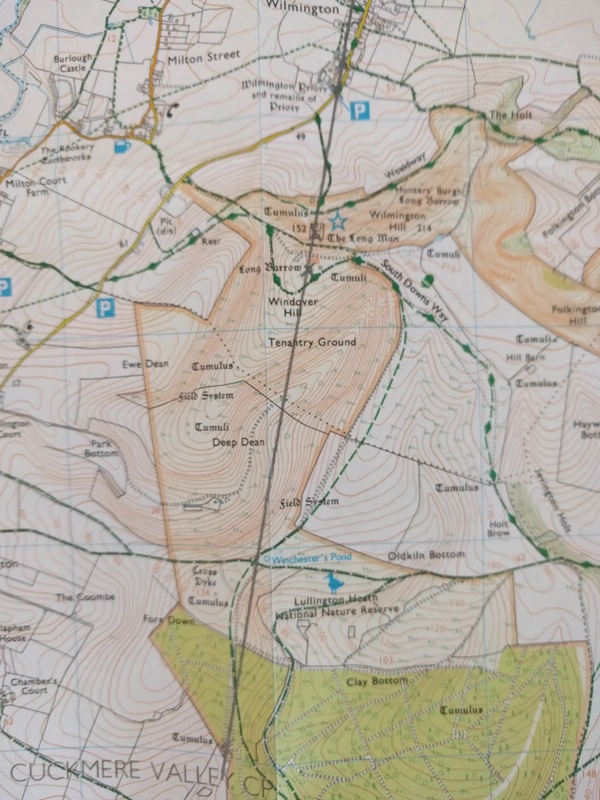 Devereux writes that “other leys may pass through and near the long man and we in no way claim this to be the best“. No explanation is given for why this was the one in the book. Our journey started at the church of St Mary and St Peter. Last time I was here was with the British Pilgrimage Trust. 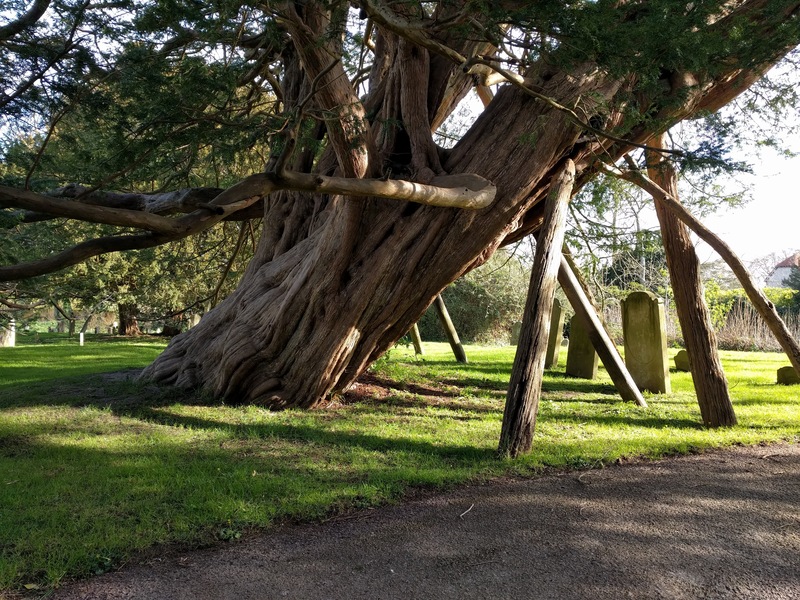 The church is beautiful and in the grounds is a 1000 year old yew tree. We stopped in its shadow for a drink of tea. 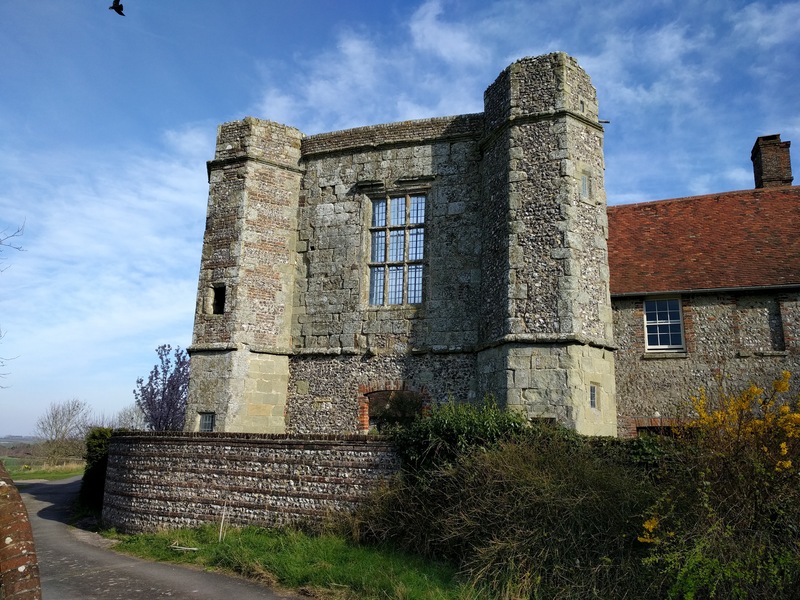 The church sits at the Northern end of the ley-line, with the second point being the nearby priory, which is now run by the Landmark Trust. The two are so close together that it almost seems like they should be a single site. The third point on the line is the Long Man of Wilmington. The two vertical lines beside him are sometimes seen as doorways, an image used notably in Neil Gaiman’s Sandman series. Watkins, the discoverer of ley-lines, has claimed that he is a prehistoric surveyor, the Dodman, with his two sighting staves. 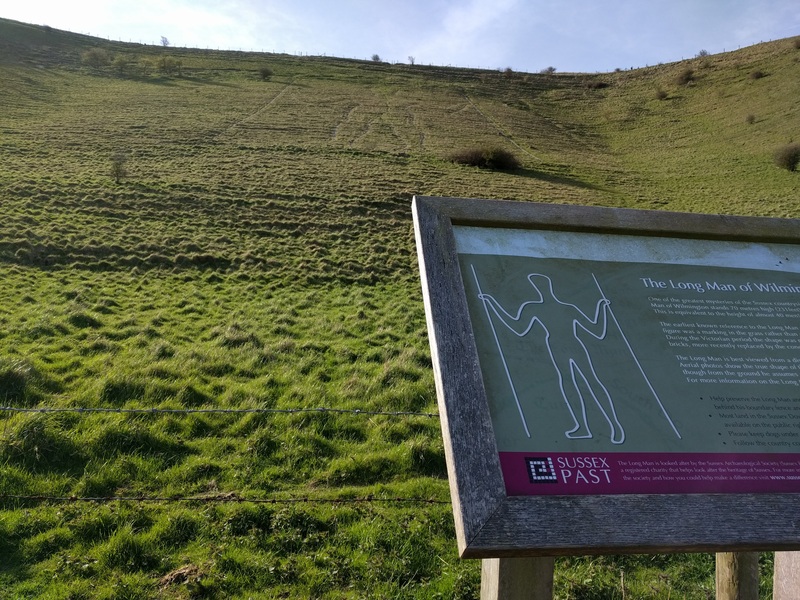 Devereux suggests that the long man is related to the nearby Litlington Horse, and makes the fanciful suggestion that there might be a South Down zodiac similar to the Glastonbury one. Fences forced us to make quite a detour to reach the fourth point on the line, the barrow on Windover Hill. The alignment of the church/priory and long-man proved a useful guide towards this point, although the long-man was hidden on the hillside. 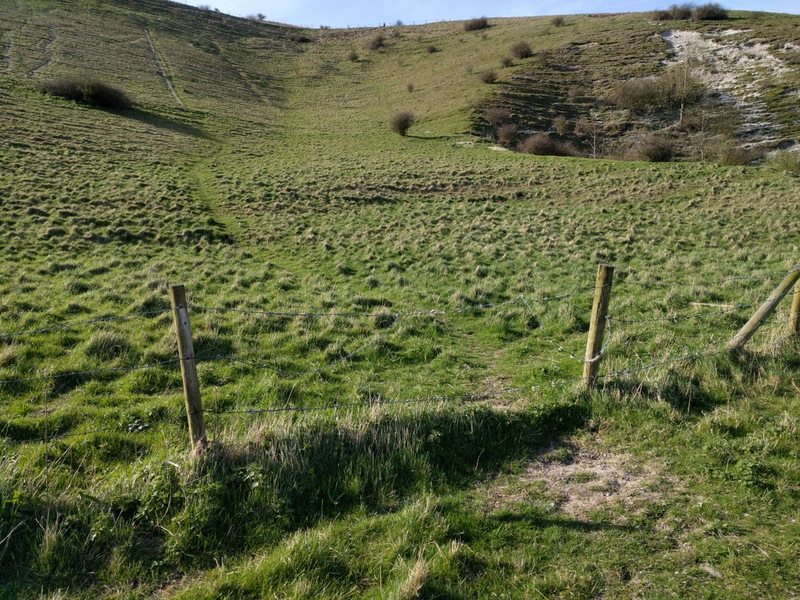 The presence of fences and prescribed footpaths make it difficult to get much feeling for the straight lines, but at this point I could imagine the ley-markers as useful way-points along the route. Watkins theorises about travellers using leys to make sure they kept on-track, even as they meandered around marshes and obstacles. The depressions near the barrow at Windover Hill were, I believe, the traces of flint-digging. 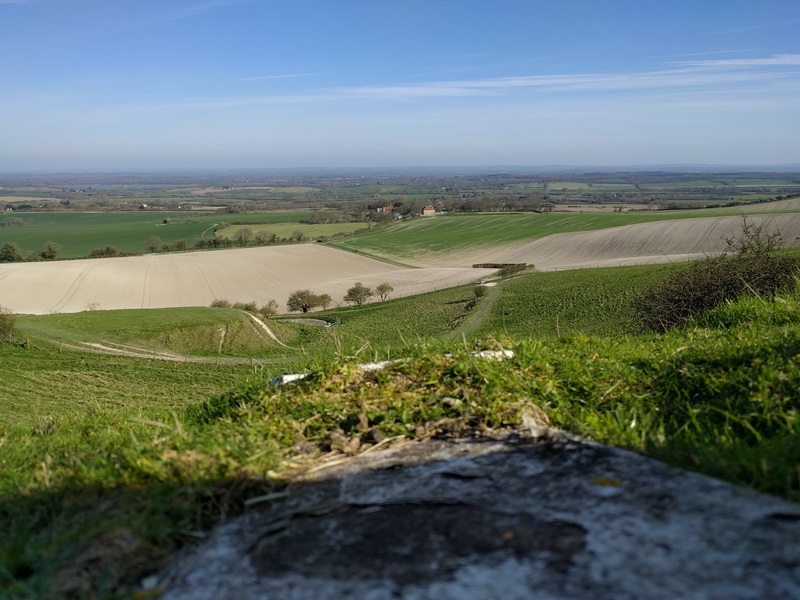 Local legend suggests they are craters from missiles hurled at the giant of Windover Hill from the giant at Firle. 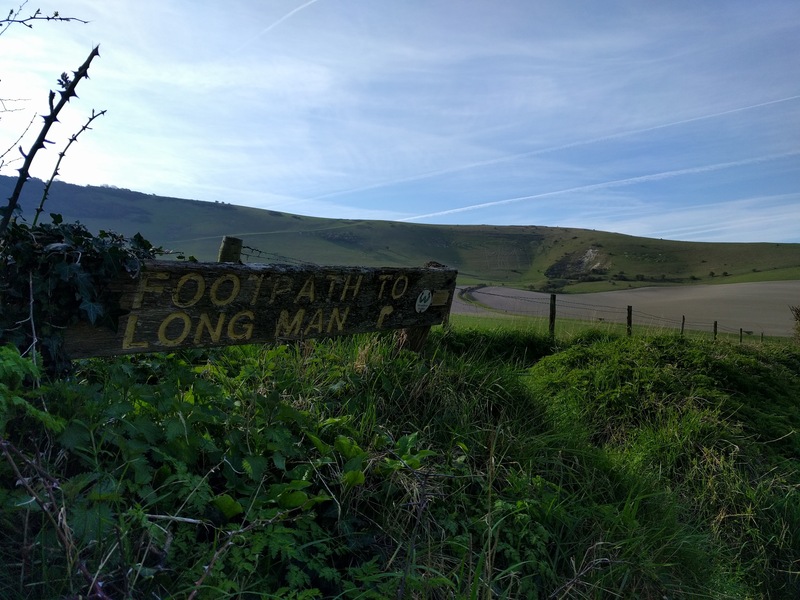 It’s often claimed the long man was originally the outline of the body a giant who died there, killed by pilgrims or another giant. 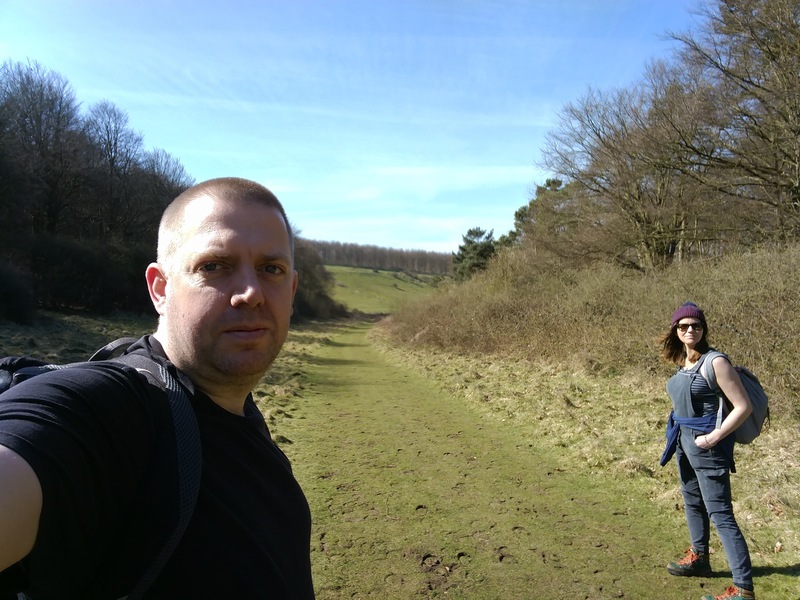 The final point, in Friston forest, was impossible to find, even with the GPS. I regretted not bringing dowsing rods, which might have been more help. I will try and get some on my trip to Avebury in June. This final ley point also some distance from the other points would have been hidden by the hillsides. Its difficulty seems to contradict the idea that the line was used for navigation; although it’s always possible there are points missing in the middle. The route led us to some beautiful scenery on the way to Exceat. 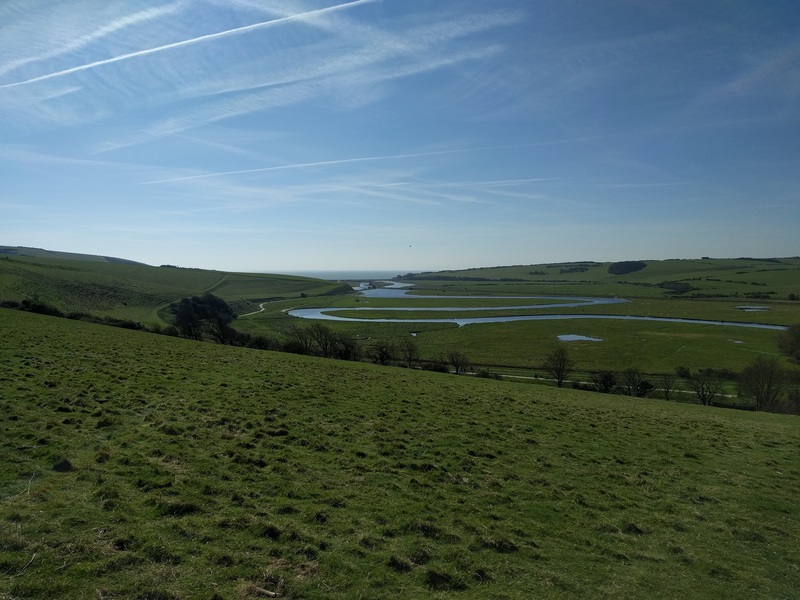 We joined with the South Downs Way, which felt pleasantly familiar. 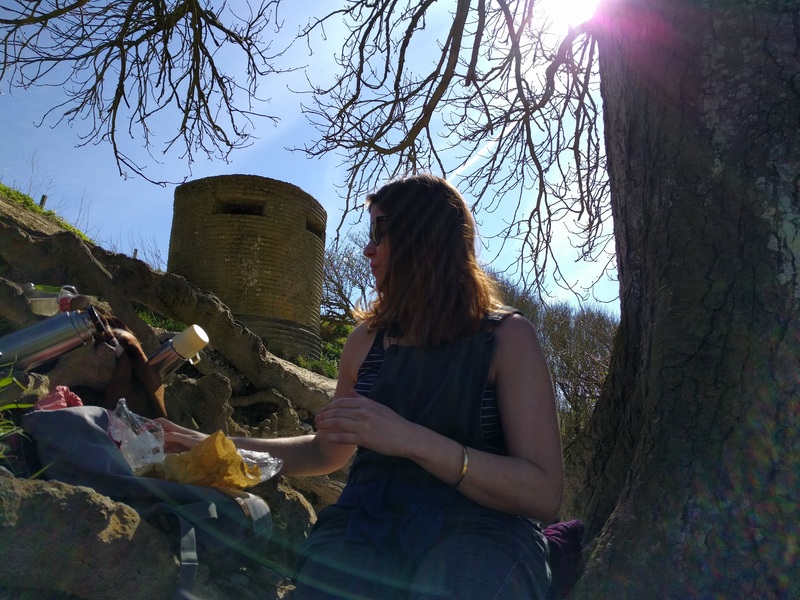 Vicky had brought a picnic of daal, which we ate at Cuckmere Haven before making the long bus journey back to Brighton. I even caught a little sunburn. It was a good day.